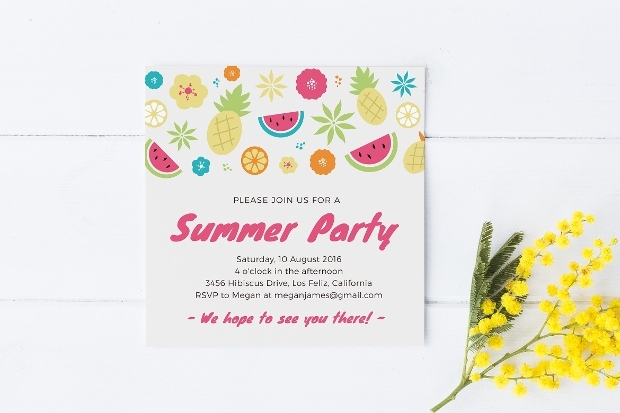 Sending out party invitations is an easy task, but coming up with a nice and attractive designed invitation may be a bit difficult to do, especially so if you are too busy with other things that need to be done. 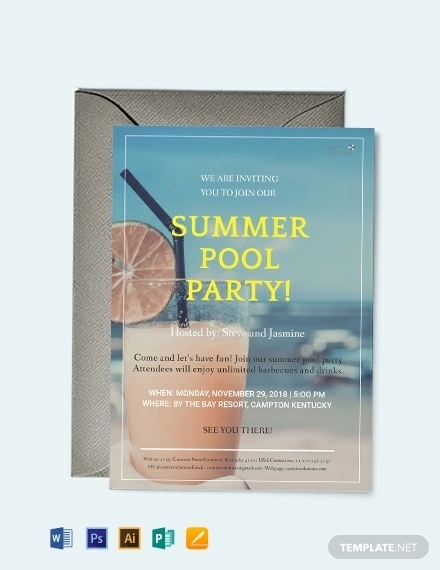 If you are going to have a pool party, it would be nice to check out a few invitation designs before you decided on how your invitation should be printed. 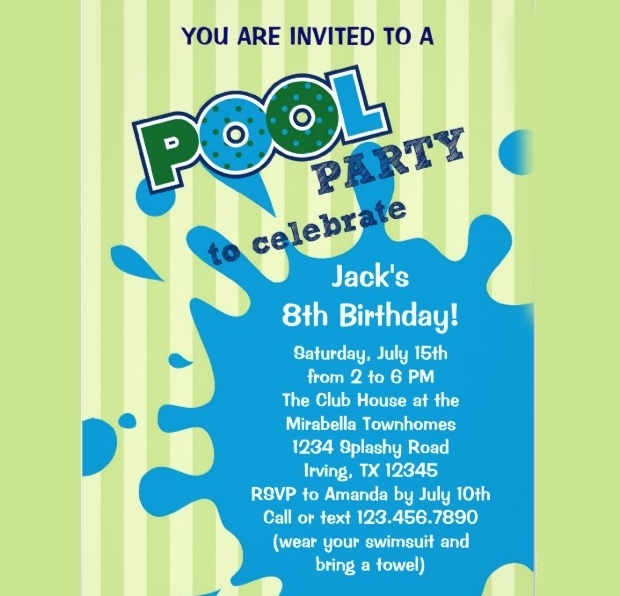 The following are some pool party invitation design samples that you can choose from. 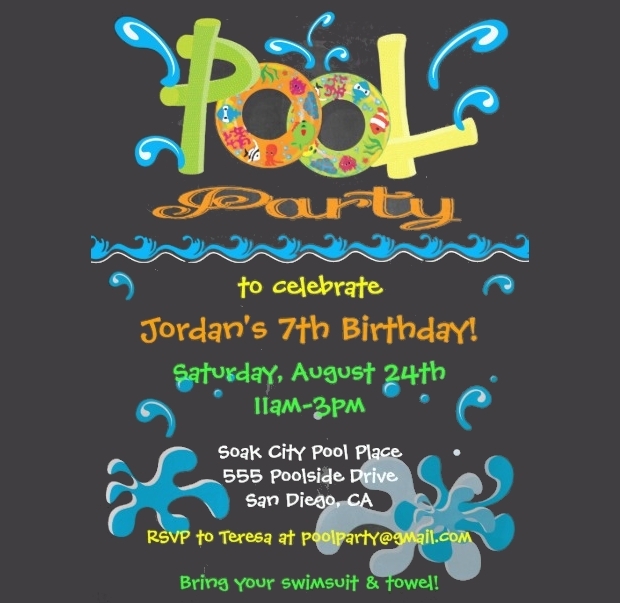 There are several options for birthday invitations, if you are going to celebrate this day with a pool party, this invitation is a good choice. 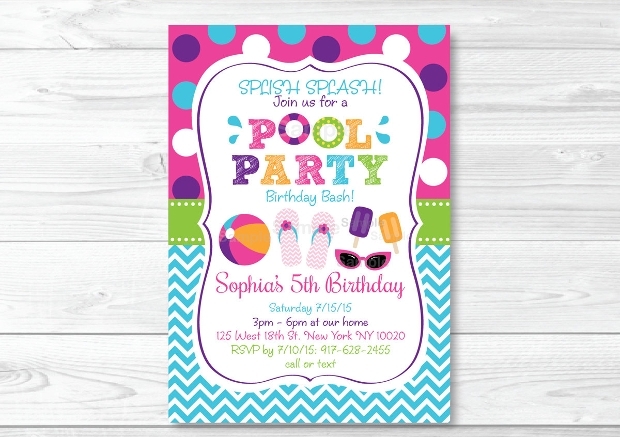 The design is very colorful and enticing with pool/swimming features like beach ball, rubber slippers, sunglasses and glass of juice to provide accents into the design. A graduation is something to celebrate. 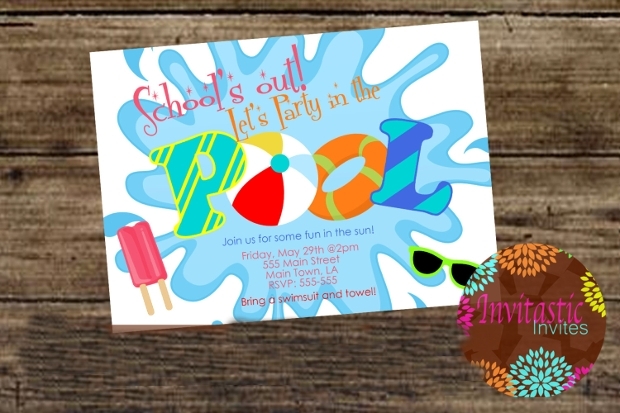 This graduation pool party invitation template is designed with a big splash of water as a main feature over the white background. 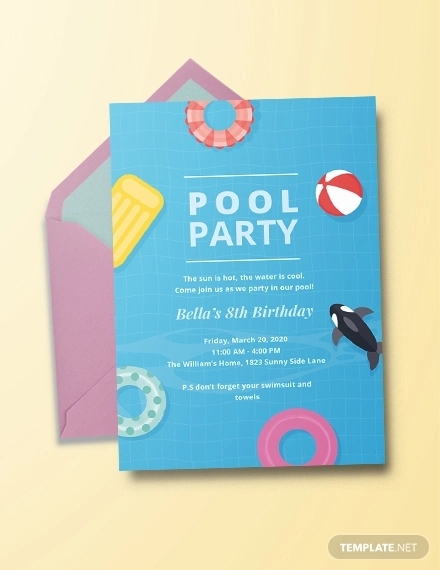 The rest of the space is accented with swimming features like the ring floatie, beach ball, sunglasses and twin popsicle. 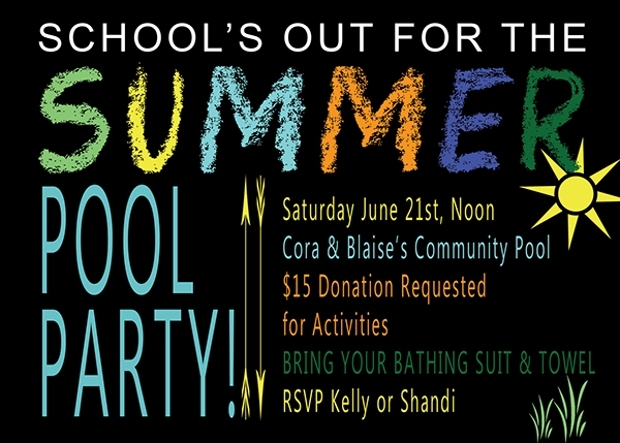 Summer is always a fun time and it can be more exciting and awesome if you can invite your friends and family to a summer pool party. 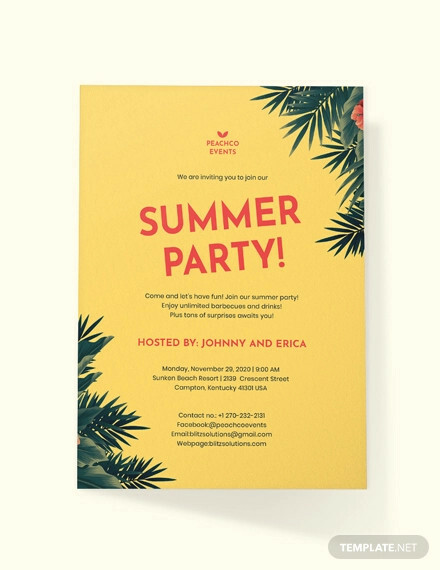 Take a look at this invitation template and be enticed with its cool design. The black background speaks of fun until the wee hours of the night. Flip flops are very much the trend for beach and pool parties. 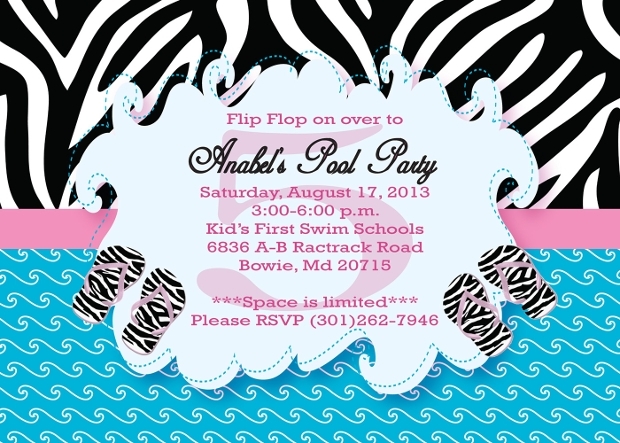 For this invitation template, flip flops are used as a part of the invitation text and as bottom accents. The black and white top half is contrasted by the blue and white water wave design on the bottom half. 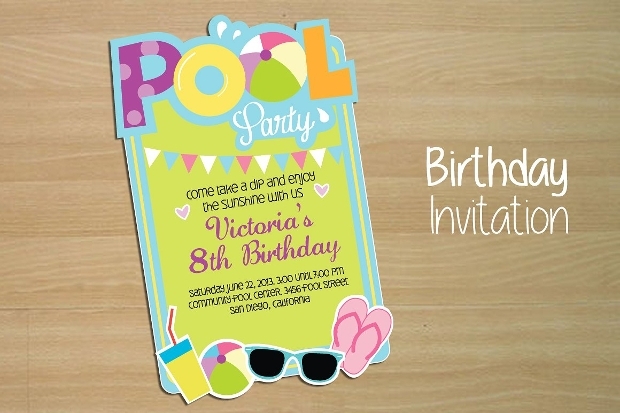 This blank pool party invitations template is designed with a simple heading and the rest is in your hands. 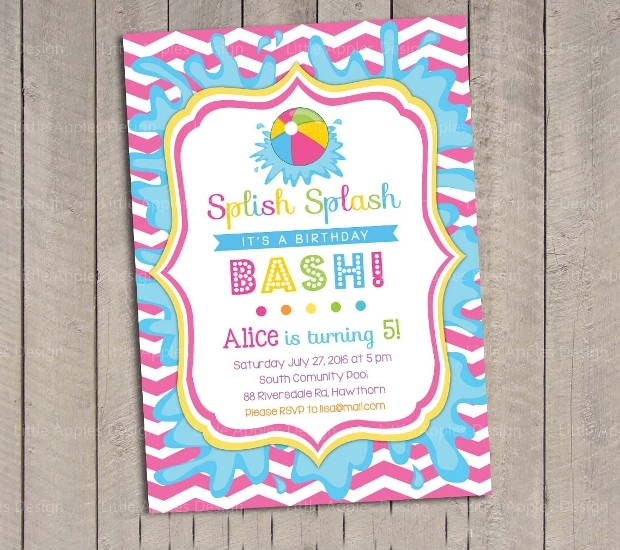 It measures 5” x7” with .1″ bleed for no border printing. 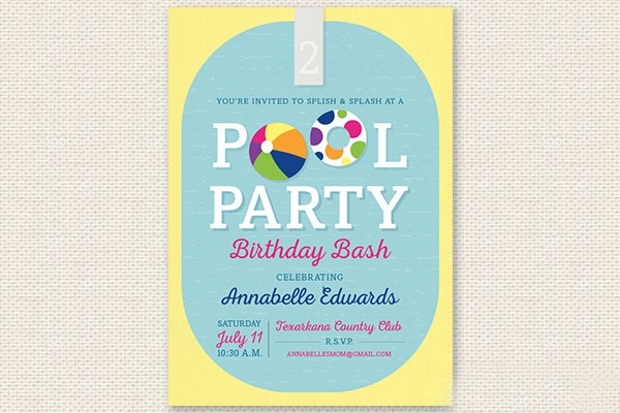 The chalkboard theme used for this pool party invitation is very cool and trendy. 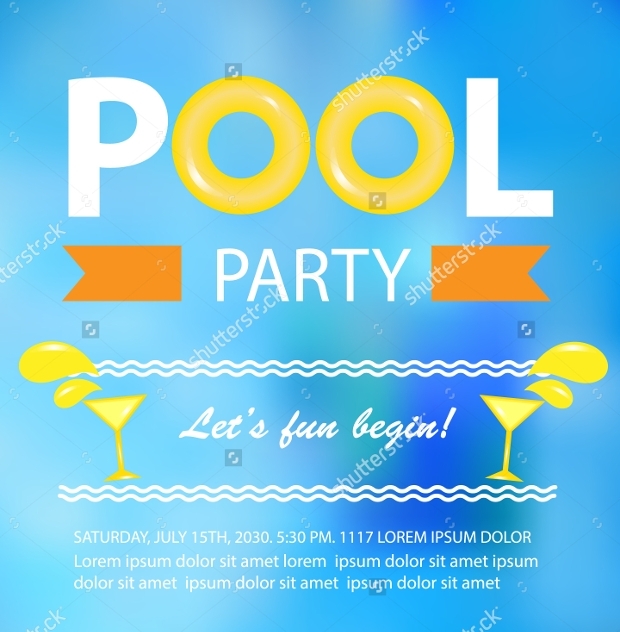 This means that if you want your friends to be enticed to join your pool party, this is the template you should go for. Who says you cannot have a pool party in winter time? Heat up the pool, invite your friends and have the best splashing adventures this winter. 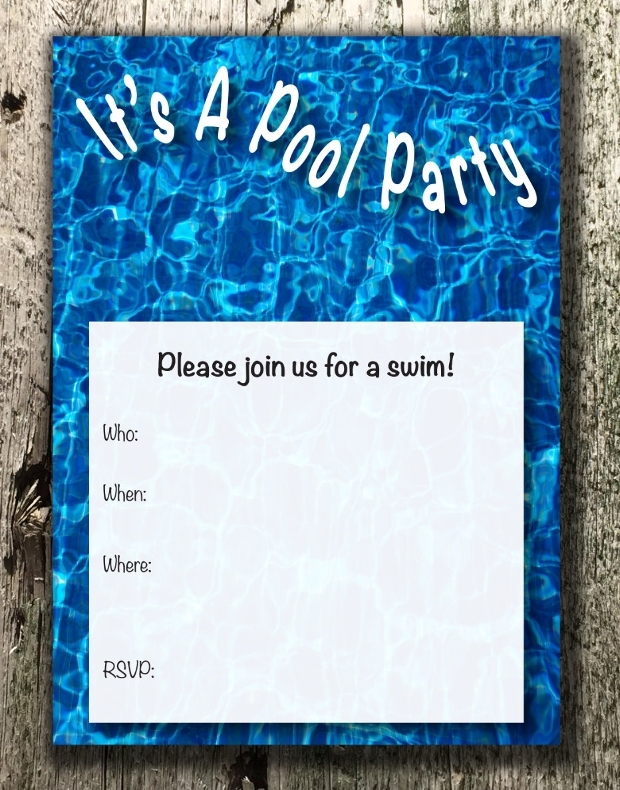 Use this winter pool party invitation to make sure that your friends are going to show up. 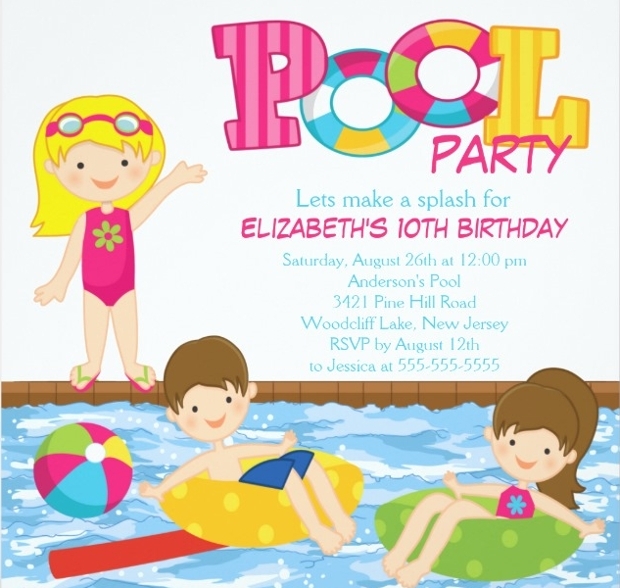 This simple birthday pool party invitations template has a light yellow background topped by a light blue space for the multi colored text. The only accents are the beach ball and the swim ring floaty. 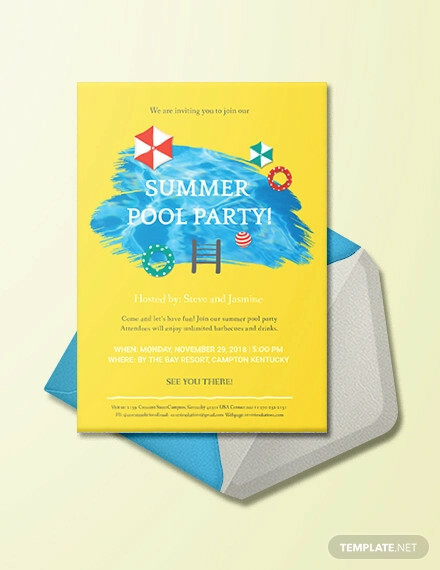 Drops of colorful waters are used as accents for this vintage pool party invitation template design. 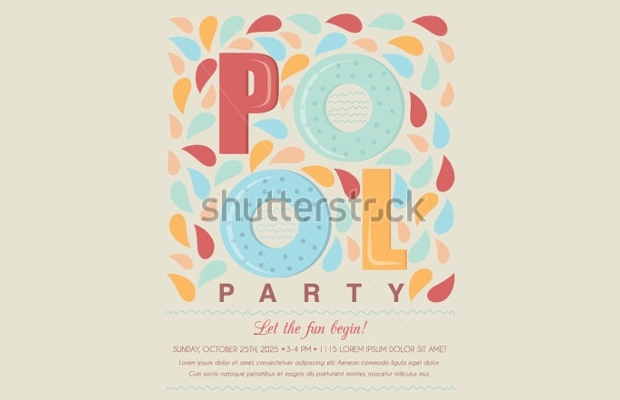 The word POOL is spelled with two pastel blue swim rings. 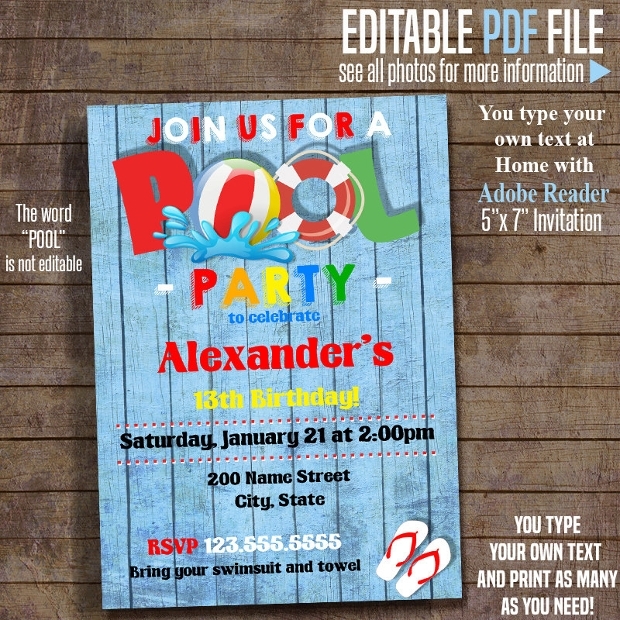 Creating a pool party invitation is made easy by the wide availability of invitation templates. 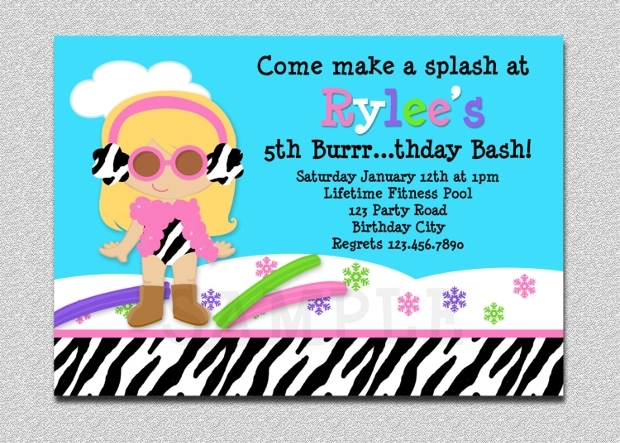 When choosing a template, you should keep in mind that you should match its design with your specific pool party theme. 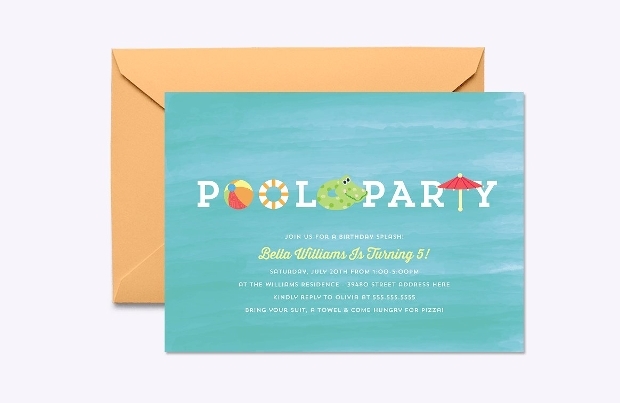 The invitation designs here are sure to entice your friends to dip in the pool.